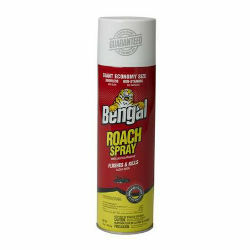 Provides a dry spray that penetrates deep into cracks and crevices to kill roaches where they hide. Insert the provided extension tube into the spray button at the top of the can. Spray into roach hiding places such as cracks and crevices, behind sinks, behind baseboards, around doors and windows, behind and under refrigerators, cabinets, sinks and stove and in attics and crawl spaces. No mess - No odor. Kills up to 20 times more roaches. Costs less to stay bug free Retreat every 4 weeks if necessary. Options: 16 oz. 9 oz.